Heavy-duty, foam filled polyethylene float tanks . 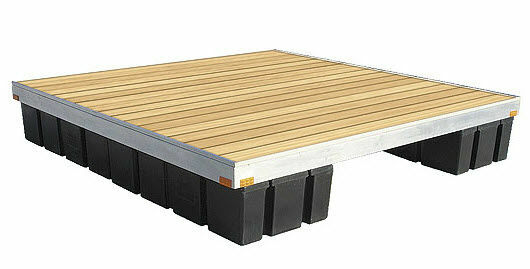 Choice of cedar, powder-coated aluminum or ThruFlow decking. Corner reflectors mounted on all sides for night time visibility and safety. The Hewitt Swim platform is available with an accessory package that includes a ladder with four extruded steps, ladder hinge kit, four corner bumpers and assembly hardware.